A hybrid bike contains features of both a mountain and comfort bike allowing the rider to ride on almost any terrain comfortably. A key feature of a hybrid is that handlebars are straight. Due to this style, the handlebars can only be adjust up and down in height. Start with the handlebars at saddle height, then adjust as necessary. Pull off the protective cap where the stem wedge is located. Loosen the stem bolt with a 6-millimeter Allen wrench by turning the wrench counterclockwise. 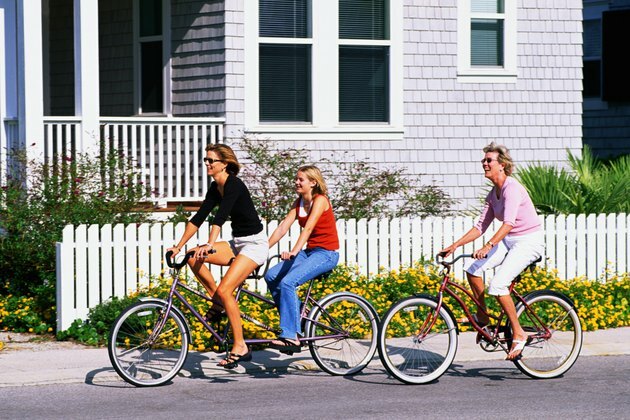 Raise or lower the handlebars to your appropriate height. .
Align the front wheel of the bicycle in the same direction as the center pole on the handlebars. Retighten the bolt turning your Allen wrench clockwise and return the protective cap. Always set your handlebars to the most comfortable height. If they are too low, you will be overextended. If they are too high, you will be reaching. Test the tightness of the bolt after retightening by facing the front of your bike and wedge the front wheel between your legs. Twist the handlebars forcefully -- if they move, the bolt needs to be tightened.